Bad Penny: Man-fest-errific!, or Man-fest-ter, part 2. Yesterday, I decided to go to a few free events run by various festivals around town. 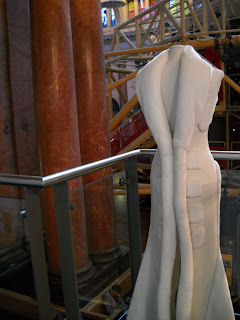 First stop: Primitive Streak Exhibition in the Royal Exchange. 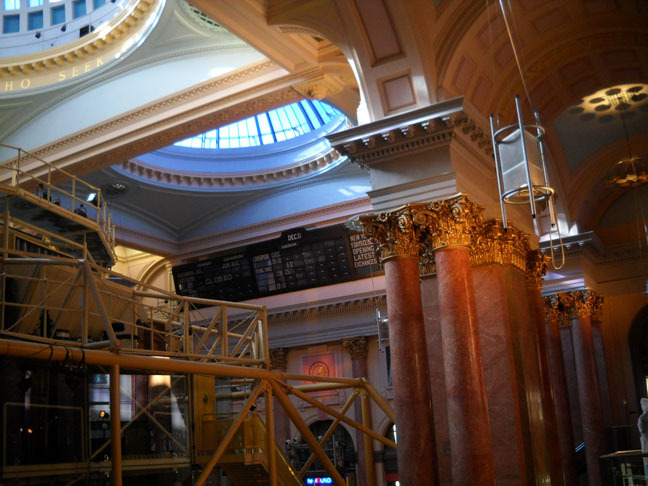 The Royal Exchange is a beautiful old building, which used to be a trading floor, back when Manchester was the cotton capital of the world. The Exchange was first built in 1792, but it's been replaced & rebuilt a few times. It's always been on or very near this site, and after it was damaged by the 1996 IRA bombing of Manchester's city centre, it was repaired. Now it's a theatre space. 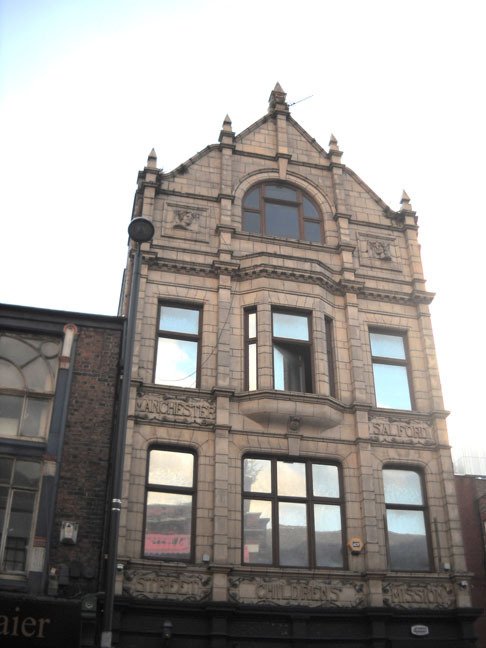 It has Manchester's only theatre-in-the-round... I think. Near the ceiling, you can see the old trading board is still up, a reminder of what the Exchange, and what Manchester, once meant. It's sort of amazing to think of Engels, standing on this same site, in his fancy clothes, hiding his real thoughts, fitting in with the capitalist classes, living the public part of his double life. Primitive Streak is a collaborative work between two sisters: Helen & Kate Storey. One's an artist, the other's a biologist, and together they designed dresses that symbolize the first 1000 hours of embryonic life. I was skeptical about this. I thought it might be a little too... well, not scientific enough. That was until I saw the dresses today. This one symbolises the neuralation stage, basically the stage when the neural plate (a sheet of neural cells) rolls itself into a tube, which eventually becomes the spinal cord and the brain. Later the neural tube will connect to the somites forming nearby, which will become the vertebrae. At the exhibit, they also showed images from Kate Storey's biological research, which really illuminated how accurate this dress is. I strongly suggest checking these out, if you're in Manchester. So well-done. I'm glad I was wrong. The Royal Exchange is right next to St. Ann's Square, where part of the MCR Food & Drink Festival (MFDF) is going on, so I wandered over. 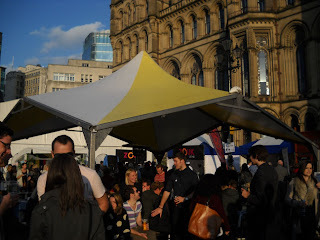 Last weekend, the MFDF was empty. It might have been the rain, or that it had only just started, but today, it was buzzing! Nice to see so many people out today, sampling food, drinking beers, enjoying the sunshine. Ok, it's not very warm, but at least it's not raining, right? I got a bag of honey-roasted pecans and an apple-cranberry-ginseng-lemonade. It sounds weird. It was delicious. 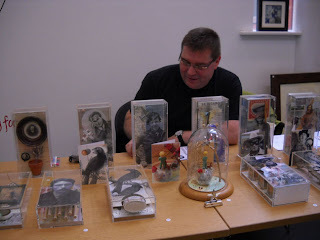 Then I wandered over to the People's History Museum, because they were having a craft fair. I was also skeptical about this, because a lot of the craft fairs I've been to are basically just people selling bit of felt glued to brooch backs for £14. Really? I mean, really? Again, I was wrong. Happily, happily wrong. He said it was the TV shows and films from when he was a kid. If you click on the picture, you can see his boxes in better detail. Amelia Earhart's on the box he's holding. That picture of her looks so modern, she poses, she smiles, like a woman from now, not the 1930s. What a star. We had a lot of fun talking about Billy the Kid and Sitting Bull and, of course, dear Amelia. 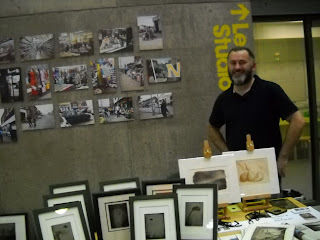 Then there was Tony Richards, doing absolutely fascinating demonstrations of Victorian wet-plate photographic processes. With wet-plate photography, you start with sheet of glass or tin, pour the chemicals over it in a darkroom to make it light-sensitive, and then take it in a light-tight holder to the camera. You can't let the plate dry, or it won't be sensitive to light anymore. You expose the plate for about 30 seconds, then run it in the holder back to the darkroom, where you pour on the developer, and other chemicals to stop the developing and to fix the image. 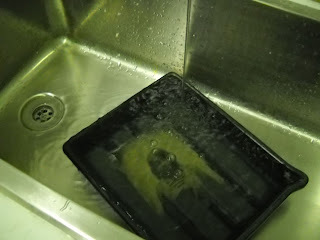 Then you run the plate under water for about 10 minutes, to get all the chemicals off. That plate is your negative. You can print from it onto photographic paper with an enlarger, or you can just put something black on the back of it, to get a positive. You can use all sorts of different chemicals to get different tones and colours. When Tony asked for a volunteer to sit for the demo, I offered, because I thought it would be fun. I didn't know he would offer to finish the plate and then give it to me! What a lovely keepsake, my own Victorian-era photographic process portrait. Truly kind, that gentleman, truly kind, I tell you. I'll get the finished plate from him in a few days or so... can't wait! He said that this kind of photography is so hard, because you never know what you're going to get. I told him about my broken camera, and how I've been feeling the same way about taking pictures with it, and we chatted for awhile about photography and mills. He's a lovely person. A talented craftsman who is also engaging and knows how to talk to people and do demonstrations without being condescending. I'd recommend him for anyone who's looking to get a professional photographer who specialises in Victorian-era photography. That's a great party theme, isn't it? I was getting mighty-hungry by this time, so I dropped by Albert Square for some outdoor street food, sponsored by MFDF. Again, MFDF was packed! 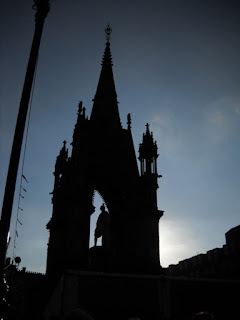 Albert Square is such a beautiful place, bordered as it is by the Gothic Town Hall, it's wonderful to see so many people out enjoying the surroundings. Isn't the Town Hall breathtaking? I got some delicious rice paper rolls from Tampopo and some absolutely mind-blowing Mauritian Roti Chaud. I'd never had Mauritian food before. The roti is more like a really big Indian roti than like a flaky Malaysian one, but they filled with a delicious butterbean curry and mustard and fresh chillies. I know. Butterbean curry. Sounds crazy, but I would eat one of those wraps every day. My mouth was on fire, so I got a can of coconut juice to cool me down. The Vegetarian Society was there, too, giving out free samples of goat's cheese and veggie sausage, flapjacks and jelly beans. I walked home, tiredly sipping coconut juice and contentedly popping Jelly Bellies in my mouth. Then I came upon one of those gems that's just hidden in plain sight. They're all over Manchester. 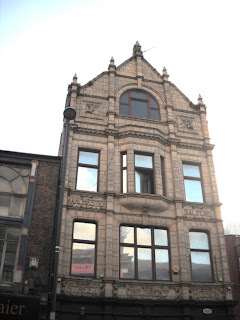 Look at this building, the carving on it. I've walked by it a hundred times and never noticed. I like to think about how many things I still haven't noticed... how many lovely surprises like this await me. What a lovely triple-barrage of posts! The most amazing thing to me is that dioramas have been spotted outside of a primary school! Incidentally, I talked with a new acquaintance last night who visited Atlanta for one day and the only thing he saw (aside from Little 5 Points) was the Cyclorama. Disappointing, but hilariously so. And the posts will keep on coming! Today, I'm on two – count 'em! – TWO walking tours! !